This 1-2 hour, self-guided tour makes a partial figure-eight through two of California’s oldest commercial and residential districts, taking you along narrow Victorian streets planted with Maple, Ash, Birch and other favorite trees of Nevada City’s early settlers. A few short but fairly steep hills make this walk invigorating, offering moderate exercise in what is usually inviting weather as colors peak near the end of October. Although the trees along this tour are numbered with painted markers on curbs and sidewalks, some of the markers will be obscured by fallen leaves. The tour description below offers step-by-step directions and visual reference points that should make finding and viewing the trees fairly straightforward. Please respect private property, being careful not to disturb the residents, and enjoy your walk. Start at the Nevada City Chamber of Commerce office at 132 Main Street, which is across from the parking lot behind Callanan Park, and a block north of the National Hotel on Broad Street. Immediately left and around the corner of the Chamber of Commerce building, you will find a bench at the entrance of a gravel pathway. Directly in front of the bench is a classic maple (tree marker #1), with palmately veined leaves boasting brilliant red color in the fall. Native to the Eastern United States, it grows to 40 feet tall and wide. The winged seeds that fall to the ground like little helicopter propellers are called double samaras. Walk back (south) toward Broad Street, passing the Chamber of Commerce and Griggs Building, to arrive at the Maidu monument at the corner of Broad and Union Street. Cross Union and enter Callanan Park at the “Monitor,” a hydraulic mining relic. In the middle of the park, at the Nevada City Lions water fountain, is a dogwood (tree marker #3). Dogwoods provide a large part of Nevada City’s fall display of color. Spring is equally spectacular for dogwoods, with pink or white blooms appearing before the leaves emerge. Exit Callanan Park where you entered and cross Broad to the historic National Hotel, then walk 1 block uphill to South Pine Street. Turn left on South Pine and walk 1 block to Spring Street. Turn right on Spring and, keeping to the left-hand side of the street, continue to a corrugated tin building marked “Foundry Garage,” which is next to the Miners Foundry Cultural Center and across from the community radio station. Next to the Foundry Garage building is a Tree of Heaven (tree marker #11), a species native to China that was brought to California during the Gold Rush and that has since naturalized in the Sierra foothills, mostly along watercourses. Walk uphill on Spring Street, keeping to the left-hand side, to the large American Chestnut (tree marker #12) at 425 Spring Street. Native to the Northeastern United States, this tree is an offshoot of the original “Colossal” variety of chestnut, and can grow 50 to 90 feet high. The ground here may by carpeted by nuts and the bristly pods that contain them, known as burrs. With the Holidays approaching, you might encounter locals stepping on the burrs to squeeze out and collect the nuts inside, or saving the burrs as Thanksgiving decorations. Continue up Spring Street, staying on the left-hand side, to where it levels out and is joined by Mill Street at a sharp downhill corner. Walk down Mill Street about 50 feet to the Common Catalpa (tree marker #13). Native to the Southeastern United States, the Common Catalpa is a small to medium-sized tree with large, heart-shaped leaves. Showy, white flowers appear in spring, followed by remarkable, foot-long seedpods. Return to Spring Street and turn right (going back the way you came) to where the continuation of Mill Street immediately goes up a hill behind a large white building, the Nevada City United Methodist Church. This brings you back to Broad Street. Cross Broad where it is safe to do so, and in the courtyard of a café almost directly across from the church is a London Plane (tree marker #21). This is the tree that graces the stone courtyards of Southern France, where the London Plane grows to towering proportions, 80 feet high or more. Although the fall color of this tree is unremarkable, notice the beautiful smooth bark in patches of white and tan, which become most attractive as winter approaches. Walk uphill, cross Commercial Street, and continue to the American Linden (tree marker #22) at 450 Broad Street. Known in the British Isles as lime trees, the American Linden is covered with small, yellow blossoms in July and is powerfully fragrant. Linden flower tea has a pleasing taste, and a history of medicinal use for relieving colds, coughs, fevers, and headaches. Lindens are found in many places in Nevada City, providing shade and perfuming the air. Continue up Broad Street a short way and cross Cottage Street to the American Sweetgum (tree market #24). This tree is often mistaken for a maple tree because of the similar shape of its leaves, which turn brilliant shades of red, orange and purple. In late fall, the ground beneath an American Sweetgum will be littered with round seed pods. Turn right off Broad Street onto Cottage Street and continue 1 long block to North Pine Street and a mature Norway Maple (tree marker #25) behind a white picket fence. The leaves of this European native are uncharacteristic for a maple, turning from a purplish red to dark bronze green in summer to yellow in fall. Continue up Cottage Street a block or so to where it levels out at Cottage and Main Street, at the old Nevada City Elementary School building (now the Sierra Academy of Expeditionary Learning). Just before the intersection with Main, on the right-hand side of Cottage and directly across from the school, is a three-trunked Big Leaf Maple (tree marker #27, across the street from the tree). This is the only tree maple that is a California native. Rarely seen in cultivation, it brightens the Sierra Nevada with its golden fall colors against a backdrop of pines and firs. Walk back down Cottage Street a few steps to the Raywood Ash (tree marker directly across from 212 Cottage) at the corner of School Street. This narrow leaf ash from Southwest Europe and North Africa turns a smoky purple shade in the fall. It is a desirable, adaptable, small to medium shade tree. Walk up quiet, shady School Street to where it doglegs left and continues to the intersection with North Pine Street. Turn right to the corner of North Pine and East Broad Street, to the large Tulip Tree (tree marker #32) at 630 East Broad. This tree, from the Southern Unites States, can grow to 80 feet high and 80 feet broad. Its flowers in April and May are brilliant chartreuse, orange, and white, with lyre-shaped leaves turning bright yellow in the fall. Walk down East Broad Street, staying on the left-hand side to the Crape Myrtle (tree marker #33) at 544 East Broad. This small tree, native to Far East Asia, thrives in full hot sun and produces outstanding late summer color. Flowers blossom in a wide range of colors from deep pink to lavender and white. Continue down East Broad Street to the where it converges with West Broad Street, forming a Y. There, in the division of the Y, is an ornate Victorian home with a white picket fence and a Silk Tree (tree marker #35) in the yard. This fast-growing tree can reach a height of 40 feet and form a canopy twice as broad as the tree’s height. The fern-like leaves are light sensitive and fold at night. Facing uphill at the Y, take the left fork to the Cutleaf Birch (tree marker #40) in the front yard of 523 West Broad Street. With its deeply cut, fernly leaves and pronounced weeping habit of growth, this tree is often described as elegant, especially in fall with its yellow leaves and in winter with its peeling, silvery- white bark. Return to the commercial section of the Historic Downtown Nevada City by walking downhill on Broad Street. 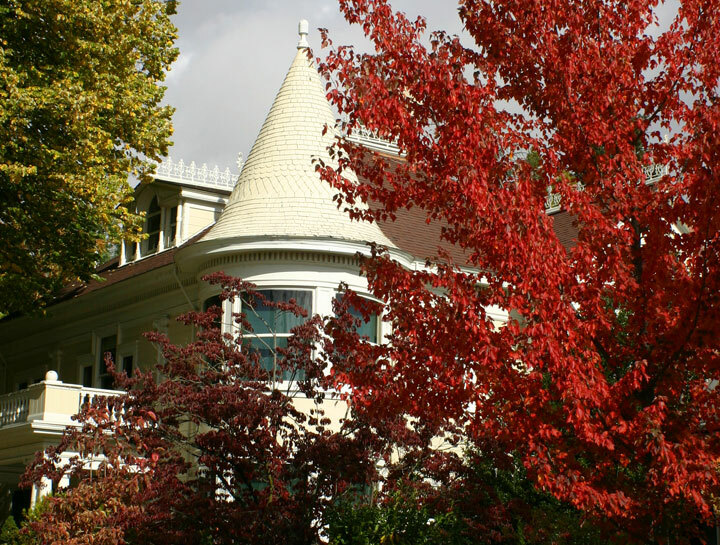 If you would like additional information on other tree tours in Nevada City, download the Nevada City Tree Tour. Or, download a printable map of downtown Nevada City.